students may obtain a sound theological education”. It was established through the co-operation of the London Missionary Society, the Wesleyan Methodist Missionary Society, The United Free Church of Scotland, the Arcot Mission of the Reformed Church in America and the Trustees of the Jaffna College Funds and the S.P.C.K. in Scotland also gave their support. Interest in this ecumenical institution grew, and churches, missionary societies and other organisations from various regions of India and from abroad joined with the founders in support of the College. In 1951 the Church Missionary Society and the society for the Propagation of the Gospel became supporting bodies. The College had received help at various times from the Danish Lutheran Church and the friends of Dr.L.P.Larsen, the first Principal of the College, and in 1959 the Danish Missionary Society became a supporting body. In 1960 the Basel Evangelical Mission (now a member of the Association of Churches and Mission in S.W. Germany) and the Kolhapur Church Council joined the ranks, to be followed the next year by the church of South India, and in 1963 by the Mar Thoma Church. The Council of Y.M.C.A’s in India joined as a supporting body in 1967 and the Church of India, Pakistan, Burma and Ceylon (now merged in the Church of North India) in 1969. Also in 1969 the Board of Global Ministries of the United Methodist Church became one of the contributing bodies. 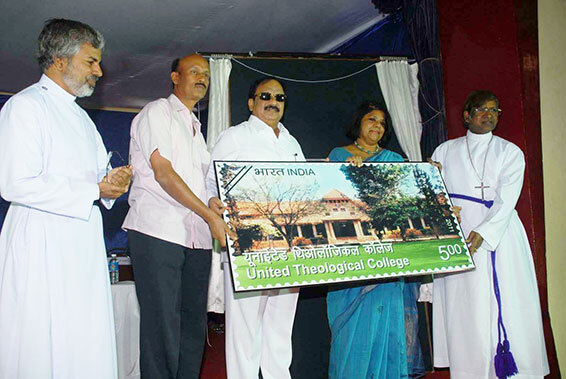 Following the merger of the Gurukul Lutheran Theological College and Research Institute with the United Theological College for B.D., M.Th.and other degree programmers in June 1971, several Lutheran Church and Missions (Andhra Evangelical Lutheran Church, South Andhra Lutheran Church, Church of Sweden Mission, the Lutheran Church of America, the American Lutheran Church-both presently merged in the Evangelical Church of America, India Evangelical Lutheran Church and the Leipzig Evangelical Lutheran Mission ) became supporting bodies of the College. The Malankar Jacobite Syrian Church became a contributing body in 1979. The first home of the College was a building on Mission Road, Bangalore city, formerly used for the seminary, which had been founded and maintained by the London Missionary Society from 1841 under the name ‘Bangalore Theological Seminary’. The permanent site of the College at 17 (new number 63) Miller’s road, Bangalore, was acquired in 1912, and the building was first occupied in 1914. In 1919, a year after Serampore College was granted permission by the Act of the Government of Bengal to grant degrees in Theology, the College was affiliated to the Serampore College for the B. D. Degree. In 1949, the Y.M.C.A Training School was re-opened, and in September 1950, eight new rooms were added to the Hostel by the Council of Y.M.C.A’s to provide accommodation for their students. In 1976,the Senate of Serampore College granted autonomy to the College for the B.D., B.R.E., and D.R.K.Courses. Under the autonomy the College has the freedom to set its own curriculum, evaluate the candidates and recommend them to the Senate for the award of the degree or diploma.